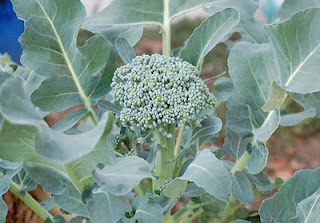 The star of our vegetable garden this month is the delicious Di Cicco Broccoli. Hard to believe it all came from a $1.79 packet of Botanical Interests seeds. 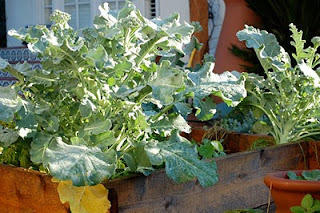 Broccoli was a top priority for our winter garden, because it's so sweet when home grown. The stems of this one are even sweeter than the florets, so I happily give my son the soft tops and scarf down the rest myself. I often eat this broccoli plain; sauces can interfere with its wonderful flavor. Di Cicco is also a beautiful plant. The site of ours, dappled with raindrops, glittering in the early light drew me outdoors this morning for a brief recharge before the breakfast dishes and diapers. I started these plants in fiber pots on our shady back porch in late August. I placed them in the bed in October (I think). This morning before the rain, my son and I enjoyed a short stroll along the lower Arroyo Seco with KPCC environment reporter Molly Peterson. 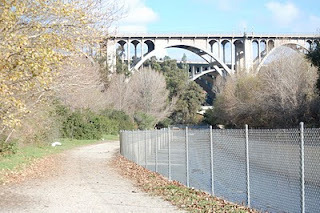 We parked at Pasadena's Lower Arroyo Seco Nature Park and headed north toward the Colorado Street Bridge (pictured above). My 2-year-old walked this, but most of the trail is accessible with a jogging stroller. Under the bridge, concrete disappears and the stream meanders. Last summer, the Arroyo Seco Foundation partnered with the City of Pasadena to restore a petite native fish, the Arroyo Chub, to this area. 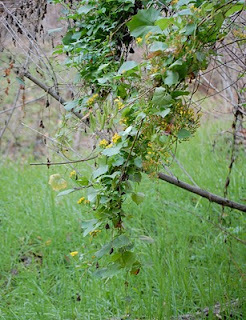 Willows and mallards also inhabit the stream bed, as do invasive plants such as Mexican Fan Palm, and cape-ivy (below). 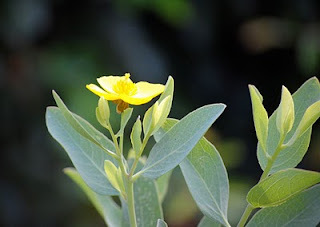 The latter is an especially brutal weed, as it will climb shrubs and trees and smother them. Left to its own devices, cape-ivy (Delairea adorata) will blanket the entire terrain, preventing seeds of other species from sprouting. It can be hard to tell destructive ivy from its more benign relatives, so weed experts advise gardeners to avoid ivy altogether. After our short Pasadena walk, we drove a couple miles south to South Pasadena Nature Park, which flanks the Arroyo on the south as the stream swings west. More recently I have been ready Bringing Back the Bush - The Bradley Method of Bush Regenerationwritten by Joan Bradley. The method is based on work by Joan and Eileen Bradley in Australia. Basically it calls for working from areas where native plants are doing well towards more degraded land. This allows the native plants to move out into the weedy areas. If one just removes weeds leaving a void, the weeds are always at an advantage for reestablishment. We will be having a "Planting Party" on January 23rd with student volunteers from Occidental College (MLK Service Day) and community volunteers. We will be planting close to the central kiosk where the buckwheat, giant rye, coyote brush, toyon and oaks were planted in 2004. The park has come a long way since it was "restored" in 2004. As we control weeds we are beginning to see native plants taking hold on their own. 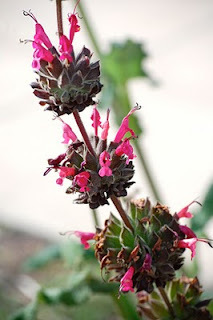 The buckwheat and California fuchsia are spreading from the 2004 planting. We have seen deerweed and datura, both native plants common in disturbed areas, and at my last visit I noticed some fiddleneck (Amsinckia). We have a long way to go but we are definitely making progress. 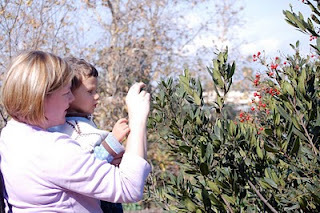 On our visit, Peterson helped my son photograph a toyon bush. He also enjoyed watching a trio of horses (plus riders) heading for the nearby stables. 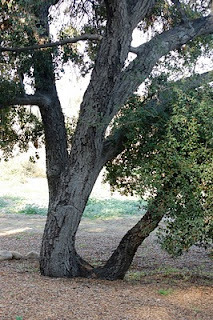 Despite the weeds, the park is a refuge for native plants, including this lovely oak. 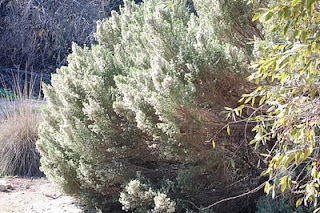 I enjoyed seeing the fluffy white blossoms of this coyote brush (Baccharis pilularis) glittering in the sunlight. This park is just east of the bike trail that runs for two miles along and in the (channelized) streambed. Lower Arroyo Seco Nature Park is located below Arroyo Blvd at Norwood in Pasadena. To get to South Pasadena Nature Park, head south on Arroyo until it meets Pasadena Avenue. The park entrance is on the right side, just before the road re-crosses the 110 Freeway. 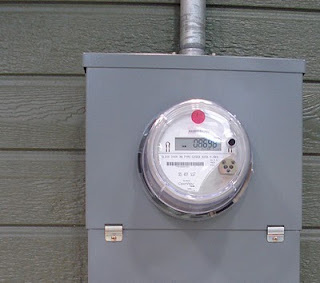 Some power companies are pulling the plug on old-fashioned mechanical electric meters, and, to the likely disappointment of growl-happy dogs, meter-readers will no longer be invading yards across SouthernCalifornia. 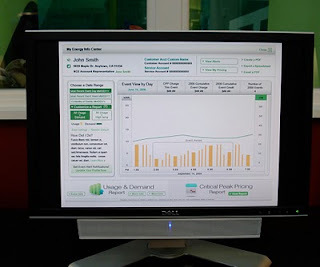 The next step is to provide detailed power-use information to homeowners, in hopes that they can assess and reduce their consumption. Two of my manzanitas are in splendid bloom. These gorgeous plants demand closer inspection. To fully appreciate them, get nose-to-nose with their tiny urn-shaped flowers--if you can find a cluster that isn't abuzz with bees. Pictured above is the cultivar 'Lester Rowntree.' I'm so pleased to host a plant named for this pioneer (woman) of native plant horticulture. Starting in the 1930s, Rowntree traveled around California, including remote spots (alone), observing its floral and collecting seed. While watering some blueberry plants sporting petite bell-shaped flowers, I recently wondered if they were members of same family as manzanitas, Ericaceae. They are. 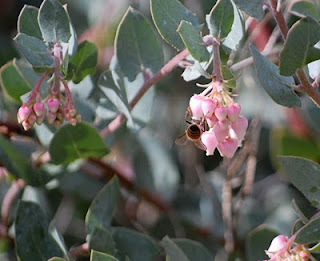 Which makes my 2-year-old's odd preoccupation with eating manzanita's flowers and hard, bitter berries even more intriguing. He was drawn to the flowers after observing bees supping from them. 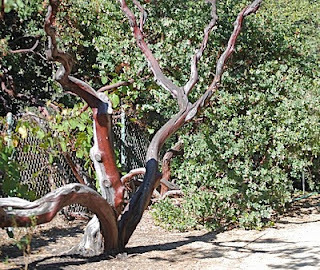 Manzanita means little apple in Spanish--an apt description for its berries. According to Kent Lightfoot and Otis Parrish in California Indians and Their Environment (yet another excellent natural history book from UC Press), some tribes along the central coast made cider from them. The Miwok dried, pounded and stored manzanita berries, re-hydrating them later. 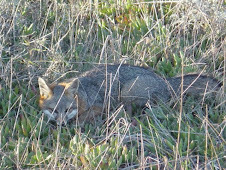 South Coast tribes often ground them into a flour. People try to put 'em down, but native plants they get around. (Apologies to Pete Townsend.) It's been about 5 years since I started my second native plant garden. Several of the original plantings are gone now, some dying inexplicably, others predictably. But in the last two years, my plants have started making their own design decisions. Aside from the annuals that have reseeded for several years, I now have a handful of perennials regenerating in my garden. About 4 years ago, a gorgeous Dendromecon harfordii crashed before I could figure out why it was dying. I felt guilty. 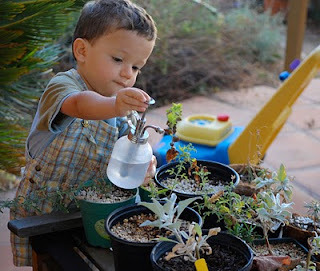 In trying to establish other plants around it, I'd probably overwatered it. Fast forward three years: a new plant has sprouted nearby (pictured above). Until this fall, a large coffeeberry (Rhamnus Californica) outside my office window afforded me a great look at many birds. I was distressed when it died. But then I remembered having seen a seedling sprouting nearby. I moved it closer to my window. It looks raring to go. Other perennials roaming my yard: Hollyleaf cherry (Prunus ilicifolia), golden currant (Ribes aureum), pitcher sage (Lepechinia fragrans 'El Tigre'). A final note (and excuse to post a cute photo): This fall I also planted some little ones--penstemon Margarita BOP, Encelia Farinosa, Verbena Lilacina--that I propagated in a class at Theodore Payne. All summer, they sheltered in the dappled shade on my back porch. My son helped me care for them. Last year, I somewhat foolishly plunked down the bucks to buy my not-quite two-year-old a snow suit and snow boots. I planned a surprise birthday trip to Big Bear for dad. It was a memorable trip--but for the wrong reasons. Our pricey, so-called lake-view room abutted the main thoroughfare, which lit our room, unflaggingly, through the night. A large storm left the town so snowy and icy, my son couldn't walk in his over-sized boots without slipping. The waterproof gloves were too big; the smaller gloves not waterproof. The sled was too scary. The visitor center was closed. The ski resort barred people from all snow recreation but skiing. So we did the only thing our toddler enjoyed: drove the streets looking for snow plows. This year, I was determined to use all that mini REI gear one more time before it was too small. 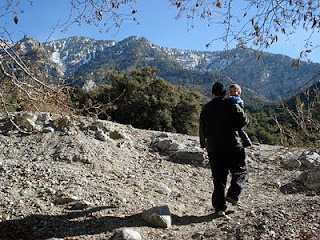 Plus, our son had been asking for a mountain trip. New Year's eve, we hastily packed the car and drove up Mt. Baldy (Yes, I know it's officially named Mt. 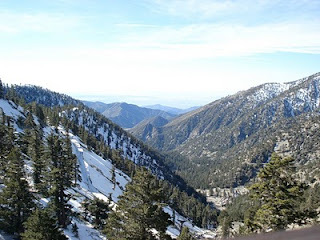 San Antonio, but folks have been calling this highest peak in the San Gabriels Mount Baldy for more than a century.) There was far less snow than I'd expected (welcome to our warming world), but it was a gorgeous day atop the mountain. The plan was to try out the Mt. Baldy Monster Tubing Park. But our son missed the (36") height cut-off by one inch. Still, he enjoyed the ride on the ski lift, and the cocoa at the lodge. I was grateful the Mt. Baldy Ski Resort management was relaxed about letting people play in snowy areas around the lodge. 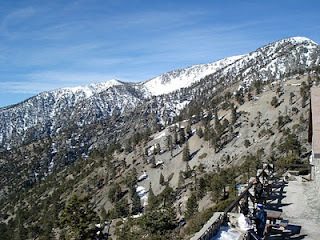 After lunch, we headed back down the mountain to the Mount Baldy Trout Pools. 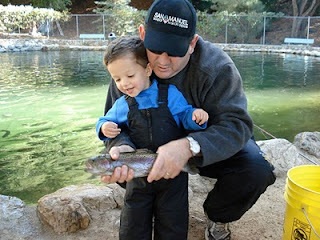 My son enjoyed catching two rainbow trout. It was so quick and easy as to be anti-climactic for mom, but perfect for a toddler. Finally, we crossed Mt. Baldy Road and idled alongside San Antonio Creek. As I packed away the snow gear, I thought, if I keep the kid skinny enough he may be able to fit into that jumper for one more year.